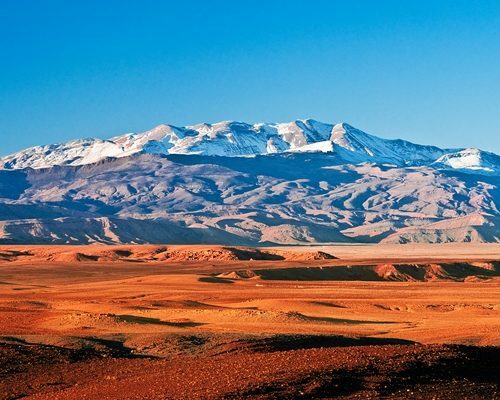 The discovery of Morocco’s southern extremes was the starting place for this exhilarating five-stage expedition along vast, remote stretches of the country, known only to a very few. 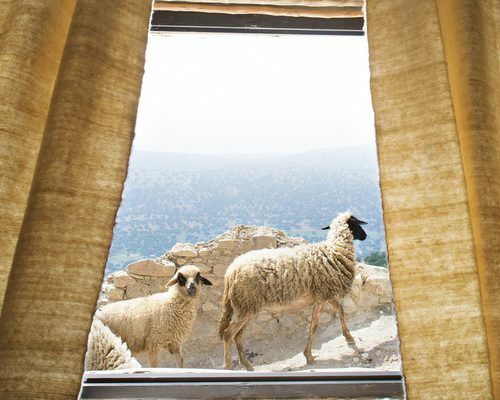 The valleys are lush with argan bushes, ochre Atlantic coast cliffs, sculptural outcroppings of the Anti-Atlas Mountains and sun scorched flatlands dappled with palm oases. 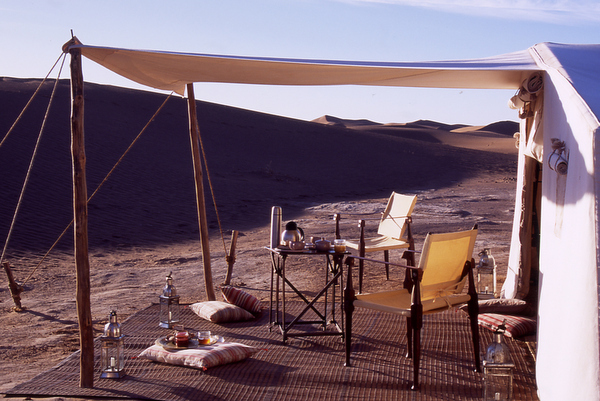 The journey through these lead to our encampment among the vast dunes of the Sahara, and finally home to Dar Ahlam. 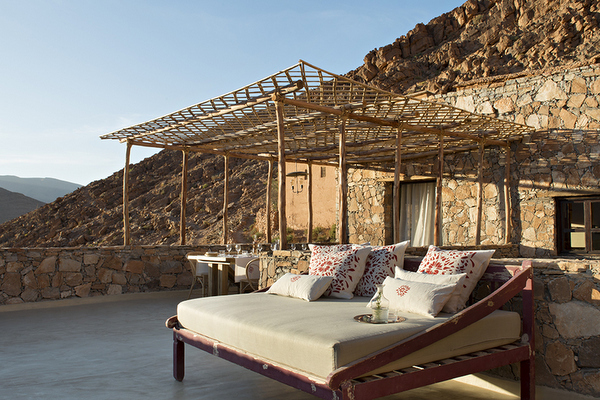 Only one booking at a time, of up to six guests, traverses this evocative, constantly shifting North African landscape. Each custom-equipped 4×4 vehicle carries two passengers and the driver. Your family or group of friends is attended to by one of our highly trained butlers throughout the journey. You also travel with French chef Thierry Alix’s recipes that reflect the rich culinary heritage along the route, as do the pastries and desserts prepared by the unrivaled patissier Pierre Hermé. 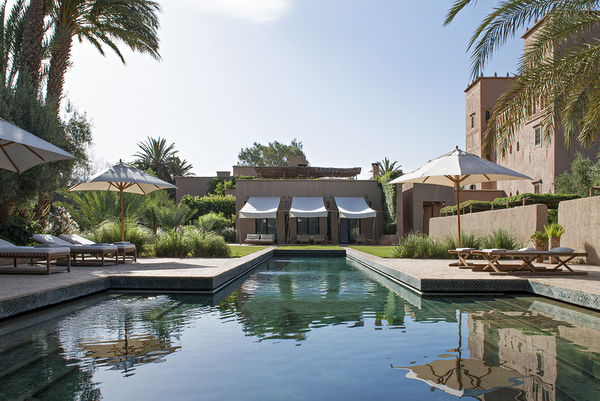 Meals are served with distinguished regional wines, and each evening we open the bar for you so you can enjoy a sundowner to accompany Morocco’s beautiful sunsets. 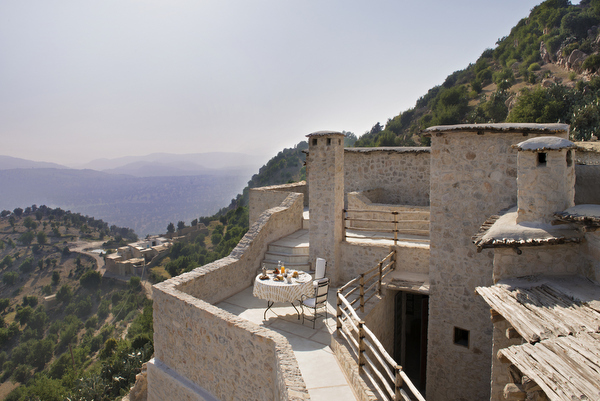 Artisans from around the region constructed these three bed-houses which are solely for guests of the Route du Sud. Each one gracefully reflects its timeless setting, yet makes present-day adventurers feel utterly comfortable among these distant yet enchanting lands. Departures from mid-September to mid-May. 68°F) in autumn and 14 to 16°C (57 to 60°F) in winter. Nestled in the heart of Tighmert’s lush palm grove, this house is ideal for enjoying a break in a close environment. Two adobe houses, each one with a living room, an outside seating area under a tent and a bathroom with shower and bath. One of the houses has a modular lounge room for a third bedroom. Facilities include heating, air-conditioning and a fireplace. 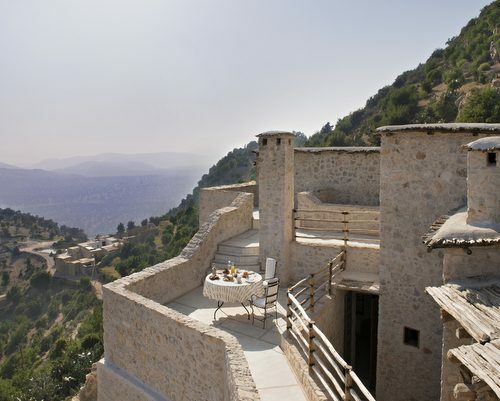 Near a matriarchal village, this house offers a stopover in a timeless place with a 180 ° view of the surrounding mountains. 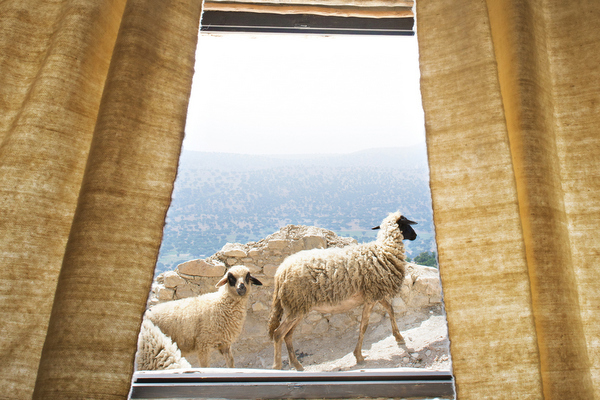 Made of red stone, located in Aoujou (near Issafen) this house has a lounge, three bedrooms and three bathrooms and numerous terraces. Facilities include heating, air-conditioning and a fireplace. (68 to 82°F) in autumn and 5 to 20°C (41 to 68°F) in winter. 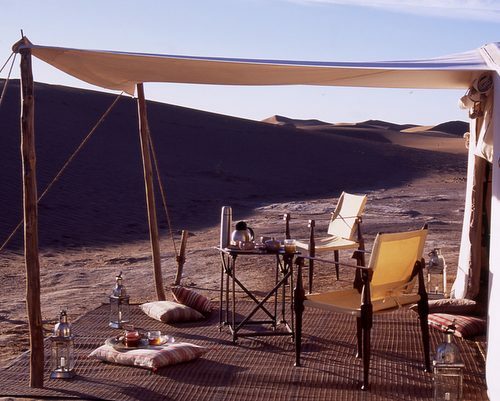 At the edge of the dry lake of Iriki, on the first sand dunes, this exclusive camp offers absolute peace. 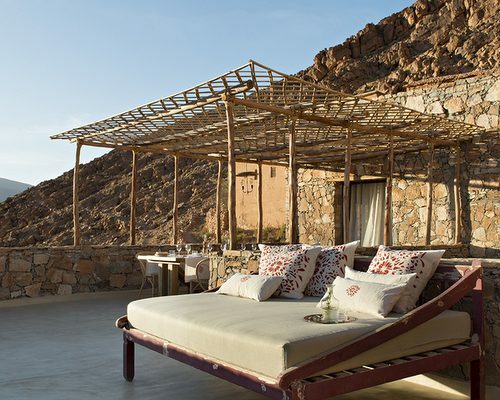 The tent includes a terrace, a bedroom, a lounge area, a country bathroom and toilet (no shower). October and hot in May and September. and 15 to 20°C (58 to 68°F) at night. October to December, temperature around 20°C (68°F) the day and colder at night. human, his instinctive and spontaneous cuisine is inspired from his travels, his encounters and exchanges. Dessert recipes from Dar Ahlam are signed by Pierre Hermé. Cost for the 6 nights including private transfers in air-conditioned vehicle is from £4800 per person (all inclusive basis) based on 4 people travelling together. 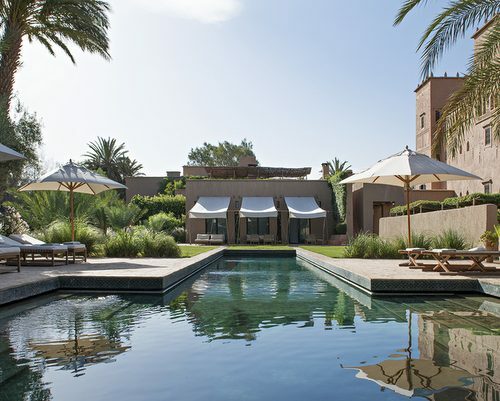 Transfer: Agadir or Marrakech to La Maison des Arganiers. Four-wheel car with driver. Air-conditioning. All excursions and activities organized along the tour. One massage per person to enjoy à La Maison des Arganiers. 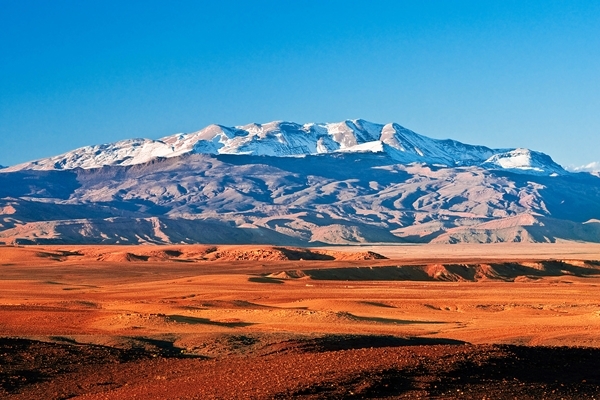 Transfers Dar Ahlam – Ouarzazate airport. per person during the stay at Dar Ahlam. Exclusive excursions away from the busy tourist trail: by four-wheel car with driver and guide. Mule ride and camel ride. Cooking demonstrations and special dinners.